LSBU's Southwark campus is to become the focus of a new five-year study investigating how current pollution levels and heat island effects in cities can be reduced through the use of natural ventilation in buildings. Funded by the Engineering and Physical Sciences Research Council (EPSRC), the Managing Air for Green Inner Cities (MAGIC) project, will examine the interaction between indoor and outdoor pollution levels and air flows through salt-bath laboratory experiments, detailed computational modelling of turbulent air flows and physical modelling of wind tunnels. The project is led by Professors Paul Linden from the University of Cambridge, Christopher Pain from Imperial College London and Alan Robbins from the University of Surrey, with LSBU as one of the major partners in the project. 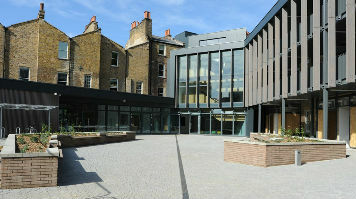 Nine outdoor sensors have already been placed within the Southwark area to monitor levels of carbon monoxide, carbon dioxide, nitrogen dioxide, temperature and humidity; an anemometer and pyrometer have also been placed on top of LSBU’s Keyworth Centre to measure wind and solar radiation. In addition, indoor sensors have been placed in the Clarence Centre for Enterprise and Innovation, to enable the study of outdoor-indoor pollutant and air flow interactions. “We had many discussions and thought very hard about where the first test site should be,” said Dr Elsa Aristodemou, Senior Lecturer in the School of Engineering at LSBU and co-investigator in the MAGIC project through her secondment at Imperial College London. Researchers from the MAGIC team will use data collected from the sensors over a four-month period to inform and validate a fully-resolved computational model that simulates the air flows and pollution dispersion around the buildings in the area. It is hoped that the findings will influence policy and aid the decision making of urban architects and local authorities for future urban design in inner cities. The computational model will enable local authorities to predict and assess air pollution and heat levels in the urban areas within their remit. Find out more about research at LSBU.